This is the Mistletoe Supply and Use part of the website. Other sections here include Supply and Use Intro, Christmas Supply & Use and Medicinal uses. Within this page there is information on mistletoe trading for Christmas, European Imports and Where to Buy. Mistletoe trading is a relatively modern concept – probably only dating from the mid-19th century when kissing under mistletoe had become popular across the UK (and abroad in English-speaking countries). Since much of the country had little or no mistletoe (see distribution pages) an organised harvest and trade began to be established. Mistletoe from the main growing areas of Herefordshire, Worcestershire and Gloucestershire began to be cut and sent around the country. This is still the case today, with a significant wholesale mistletoe market centred on Tenbury Wells on the Worcestershire-Herefordshire border. The mistletoe auctions at Tenbury have a long history – at least 100 years. They seem to be the sole survivor of may have been a common sight in the market towns of the ‘three counties’ (Herefordshire, Worcestershire and Gloucestershire) from the mid 19th century onwards. There is a lot of other mistletoe trading across England’s mistletoe area too, with much trading direct to local and national wholesalers and, with the advent of the internet, increasing amounts of direct retail trade to customers across the country. The mistletoe trade in Britain is significantly dependent in imports from mainland Europe – and despite regular scare-mongering media reports that this is somehow ‘new’ and to be resisted, it’s actually been going on for well over a century. Britain, with its limited natural mistletoe populations in the south west midlands, was probably never able to fully meet the Victorian demand for Christmas mistletoe and there is a substantial cross-channel trade in November and December. These pictures (left and right) show French mistletoe being harvested in Normandy and Breton Orchards, specifically for export to Britain, in the 1920s and 1930s. Note the traditional costume – the women’s hats don’t look very practical for mistletoe harvesting! The lower pictures show crates arriving at Southampton Docks, and subsequently at Nine Elms Station London, in the 1920s and 1930s. The wooden open-slatted crates are often a good clue to imported mistletoe – they are a style that has been used for decades (they’re in the 1930s pictures above) and are still sometimes seen today. British mistletoe is usually packed much more loosely. 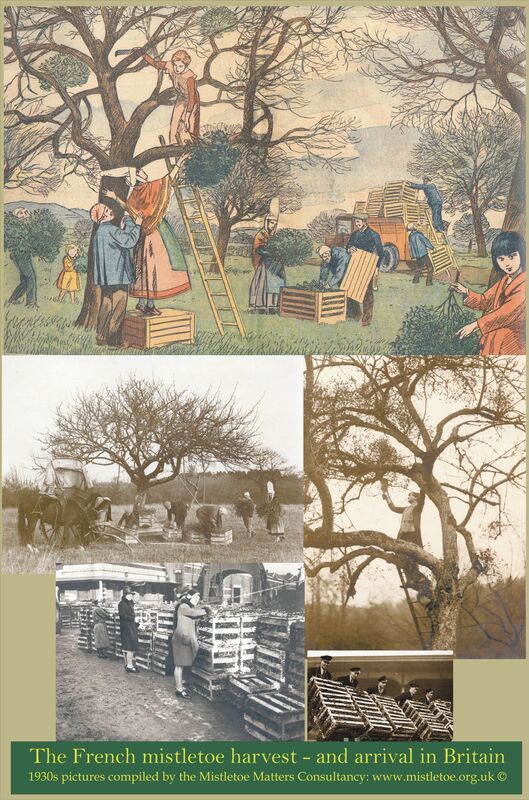 Poster download: The Mistletoe Matters Consultancy has assembled some vintage (1920s and 30s) pictures of the French Mistletoe Harvest and export to the UK.It can be downloaded here. Note that it is a large file (about 4 MB) and is optimised to print at about 300 by 450 mm. The mistletoe kissing custom is a very British tradition – our continental cousins are much less reserved, and usually don’t need such excuses for their kissing! The kissing custom has spreaa, of course, and so is widely used on the continent too but there also many allied mid-winter mistletoe customs across Europe, mostly relating to mistletoe as a symbol of peace and of good luck. Several other artists also painted these Marchands de Gui – including Barrere (left) and Picasso (right). Well, a lot depends on where you are. If you’re in Britain there are various ways to obtain mistletoe, depending on where you are and how much you want. In mistletoe’s main growing areas it is often fairly easy to obtain from local traders and shops, but elsewhere you may have to make more effort, and you also run the risk of buying mistletoe that isn’t very fresh-looking. Wholesalers wanting British mistletoe should be thinking about supply direct from the south-west midlands, and maybe going to buy it direct from the Tenbury Wells mistletoe auctions in November and December. To find out more about the auctions visit Nick Champion’s website http://nickchampion.co.uk/auctions/holly-and-mistletoe. Dates for 2018 are Tuesday 27th November, Tuesday 4th December and Tuesday 11th December. But going all the way to the Tenbury Wells Auctions is not recommended if you just want a few sprigs for the living room. If you want smaller amounts of genuine British (mainly English, but the mistletoe region does extend into Wales in lowland Gwent) mistletoe in freshly-picked condition then you need to look at other options. If you’re online (which you are if you’re reading this) then your best bet might be to try one of the specialist mistletoe mail order sites that have appeared in the last few years, catalysed by the original Tenbury English Mistletoe Enterprise website I helped set-up back in 2005. That partnership no longer exists and my own English Mistletoe Shop no longer sells online but there are several independent spin-offs, which you can find by searching online (I’m not going to recommend any above any other!). If you’re in mainland Europe there are many other sources available to you – as mistletoe is much more abundant in some parts of Europe than in Britain. If you live elsewhere then you’re probably using a different species of mistletoe entirely. For example, in the USA the usual ‘Christmas mistletoe’ is one of the Phoradendron species, which are generally harvested from southern states, with a trade traditionally centred in parts of Texas. This is part of the Mistletoe Supply and Use parts of the website. Other sections here include Supply and Use Intro, Christmas Supply & Use and Medicinal uses. Within this page there is information on mistletoe trading for Christmas, European Imports and Where to Buy.